Today we offer to your attention the interview with Mr Urs-B. Hauser, but this time our questions concern his «child» – Belvedere Swiss Quality Hotel Grindelwald 4*. Ski web portal SKITOURS RECOMMENDS! SkiT. : Choosing an accommodation at the Grindelwald resort, tourists surely consider an option of staying at the hotel Belvedere. How do you manage to hold attention and love to the hotel on the tourism market? U-B. H.: Our hotel has been built by my grandfather. The hotel therefore exists for over 100 years. I am the third generation running the business and by 2018, my son Philip, the 4th generation wants to continue. The Belvedere is our life and we do everything possible, everything in our hands, to keep the hotel successful. By having a good website in many different languages, by visiting Tour Operators all over the world, we try to get Grindelwald and the Belvedere known. Thanks to the fantastic marketing, done by the Jungfrau Railways, we get many visitors thanks to them and thanks to our unique nature and mountains. SkiT. : The hotels with the name «Belvedere» can be met at the numerous resorts all over the world. Are you included in any hotel chain? What is the conception of the hotel, and who is in your focus group of clients? U-B. H.: Belvedere means, translated from Italian, «beautiful view». Just like in French «bellevue». There are many Belvederes all around the world, just like many Bellevues. Each one of these hotels has different owners. Some belong to a chain, some not. 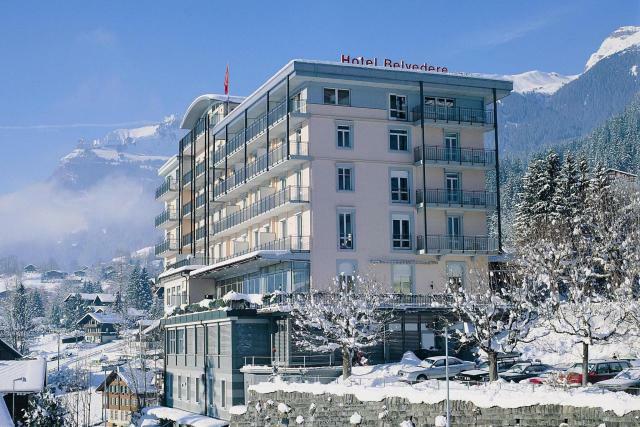 The Belvedere is a part of the Swiss Quality Hotels, a voluntary chain of over 80 hotels. Thanks to them, we are linked to all major GDS and have contact to the whole world. The Belvedere is mainly a hotel for an individual clientele. However we accept also small groups, those mainly from Asian countries. We also love small ski groups and incentives. SkiT. : Booking a room of certain category in the hotel is not a big deal. That can be done individually, using various online-booking systems, or with the help of a travel agency. Tell us, please, what is the best way of booking rooms at your hotel? Do you provide your guests with an overnights stocking system or, probably, is it possible to get a loyalty card? U-B. H.: Our hotel, as mentioned, can be booked through all well known channels. We of course however prefer, if our guests book directly, online on our website – www.belvedere-grindelwald.ch or via e-mail, fax or phone. We offer the following: if guests reach within 5 years a turnover of CHF 10 000 – then they get a credit of CHF 1000. If they reach more, then, of course, also the credit will be higher. SkiT. : Tourists, who stayed at your place, appreciate your impeccable service as well as the unique gastronomic diversity. Is it difficult to meet all the guests’ requirements practically? U-B. H.: Our guests come from all over the world. Therefore it is not easy to match all the requests, yes it is impossible. However, if somebody is a vegetarian or if there is any allergy to any food, our Chefs will do their utmost to please the person. However, it is not possible to serve Kosher food, for example. SkiT. : Could you tell us more about the history of the Belvedere hotel and development strategies carried out during the century? U-B. H.: In 1907, the hotel opened for the first time. My grandfather wanted to build a big hotel. However, unfortunately, due to the start of the 1st World War, he could build only one extension. At that time, my grandfather worked with a famous big Travel Agency in Great Britain and they filled his hotel for 3 month in the winter and 3 month in the summer. Inbetween seasons, the hotel was closed. There was only an individual clientele, all from Britain, and they stayed all for a period of 1-3 month. Later some Swiss and guests from other countries in Europe and the USA started to come. From about 1986, the Japanese came in big numbers and they came mainly in groups. Thanks to them it was possible to keep the hotel opened in spring. During the winter time, skiers from Switzerland, Germany, Great Britain, Canada and the USA filled the hotel. About 10 years ago, the first Russians and people from Ukraine visited our hotel and many of them afterwards came back for several years. As many of these guests spoke only Russian, I decided to learn that interesting, but difficult language. After several years, my Russian was pretty good, but, unfortunately, lately, we did not have the pleasure and honor of welcoming the guests from these countries anymore, or only very few, so I forgot a lot and will need a lot of work to get back to the level I once had. SkiT. : Who are your guests? What countries do your clients arrive from? How many tourists from Ukraine and Russia did relax at your place during the previous season? U-B. H.: Our guests come mainly from Switzerland, in winter as well as in summer. We also get still quite a good number of guests from Great Britain and that despite Brexit and the weak British Pound. In summer we receive many guests from all over the world, for example from Korea or Taiwan, also there are guests from Arabic countries. We once had about 10% of our clientele from Russia and Ukraine, however since the Ruble has lost so much value against the Swiss Franc, we unfortunately could welcome only a very small number of guests from Russia and Ukraine. SkiT. : Winter holidays are in high demand, and most ski resorts are ready for new season opening. How have you prepared for the beginning of the ski season 2016/2017? Did you provide your guests with early booking service? What special services do you offer your guests in this season? U-B. H.: The winter season has already started, the valley of Grindelwald is already white, and there is a lot of fresh snow up in the skiing area. We have offers for skiers and non-skiers on our website. There are some special offers this winter season: The Jungfrau Railways and many hotels offer a free ski pass from Monday to Friday. Only on Saturday and Sunday, the ski pass needs to be paid for. This special offer can be booked through the website of the Jungfrau Railways (www.jungfrau.ch), but it can also be booked with us at the hotel. As the Jungfrau Railways ask for an immediate payment and no cancellation is possible afterwards, the same rules are valid, if the booking is made at the hotel. We therefore recommend having travel insurance. SkiT. : How many rooms and what categories does the hotel provide? U-B. H.: The Belvedere has 56 rooms, and there are several categories: standard, classic, deluxe, junior-suites and also different kind of family suites. SkiT. : How far is Belvedere situated from ski slopes? U-B. H.: There are 3 transport systems taking the guests up to the skiing areas: The Männlichen gondola, the First gondola and the train to the Kleine Scheidegg area. The Belvedere is located just 3 min. walk away from the train station to Kleine Scheidegg and in the middle between First and Männlichen gondola. The local ski bus is departing to next to the hotel every 15 min. However in the morning, the Belvedere is driving its’ clients with the hotel minibus to the gondolas. In the evening to get back, the guest can take the local ski bus, also then running every 15 min and stopping right next to the hotel. SkiT. : What categories of mountain skiers is the hotel Belvedere Grindelwald for? U-B. H.: Grindelwald is ideal for intermediate skiers and also very ideal for beginners. Of course, experts also find some very difficult runs. I would like to remind you of longest World-Cup downhill race at Lauberhorn (Kleine Scheidegg skiing area). However the majority of the slopes are just perfect for intermediate skiers and beginners and also for snowboarders, as there is a snowboarding paradise at the First skiing area with one the biggest half pipe in the Alps. I would like to remind you that Grindelwald is also very ideal for non-skiers as there are many toboggan runs, among them the longest in the world, with 16km. There are also lots of winter hiking trails in Grindelwald and there are some famous excursions like Jungfraujoch – Top of Europe, or Schilthorn with the revolving restaurant where a James Bond movie was produced. Schilthorn, by the way, is the third skiing area of the Jungfrau-Region. Also you can go on a one-day excursion to the cities like Bern, Lucerne, Lausanne, Montreux. SkiT. : The ski resorts give the excellent opportunity to stretch the muscles as well as to clear a head. The demand for business tours is increasing. What can you propose your guests, who want combine work and relax? U-B. H.: As it was mentioned, we also welcome incentives quite often. For incentive groups we recommend to contact «Eiger Vision». That company is organizing fantastic outdoor events for all budgets. For example, it is possible to visit the famous North Face of the Eiger with them, something nobody else can offer. We suggest to enjoy our nature during the day and then in the evening to do the work in the seminar room. SkiT. : Holidays in the mountains don’t end with skiing, snowboarding, skating etc. What can you offer as après-ski? U-B. H.: Apres-ski in Grindelwald is happening in the centre, not at the hotel. The hotel has an excellent pianist, playing in the bar; however the discos and the busy bars are all located in the centre, 5 to 10 min walk from the Belvedere. That is also an advantage for the hotel, as it can get pretty noisy around the bars. SkiT. : What wellness and beauty services can the guests of Belvedere use? U-B. H.: The Belvedere offers for the guests an indoor-pool, an outdoor-salt-water Jacuzzi, an indoor-Jacuzzi, a sauna for everybody that can also be used by children as not so hot and it is to be used with bathing suites, then there is a hot sauna and a steam bath, that however is naked zone and not allowed for children. We also have two massage therapists and a lady doing perfect beauty treatments. SkiT. : Grindelwald and its surroundings, surely, can propose a lot of interesting and cognitive things. What excursions can you arrange to your guests? U-B. H.: Except abovementioned excursions it is also possible to organize a private Limousine Service, not only for transfer from and to the airport, but also to enjoy full day or half day of excursions. SkiT. : What special offers will you offer to your tourists this winter season? U-B. H.: There is free ski pass during the winter for the weekdays. It needs to be booked in advance and paid in full immediately at moment of booking and cannot be cancelled. Ski pass is offered by the Jungfrau Railways and there are their conditions. We also offer for non-skiers free tobogganing or winter hiking passes. Everything is available on our website. SkiT. : What is the rates range for accommodation in Belvedere? How flexible is your pricing policy? U-B. H.: Our rates differ a lot between low season and high season. They also differ between mid-week and weekend days. On short notice, often on our website, we offer very special deals, if the occupancy of the hotel is not satisfactory. SkiT. : I am sure, that will be interesting and useful for our tourists and visitors of our web portal to get to know some secrets and nuances about working with children in the hotel. U-B. H.: The Belvedere offers for children a games room, where they can play table tennis for example, baby football and more. We have all kind of family rooms and family suites that are ideal for families. In the restaurant there is a card with special children dishes. Grindelwald offers also two ski schools for children. SkiT. : At the very end of our interview, could you tell us about your ambitious plans and ideas for the future? What special and extraordinary can you propose the guests in the nearest future? U-B. H.: The nearest future is tomorrow. We are right now renovating our 4th floor; all will be ready by Christmas. More rooms will be renovated in April and May of next year. The new rooms will get wooden floors and box-spring beds. Our plans are still to extend the hotel, to double it's size, however that is not going to happen within the next 5 years.